Oberreute - cross-border winter hiking trail • Winter hiking » Bodensee! Demanding, rolled winter hiking trail with a beautiful view of the mountains from Oberreute into the neighbouring Austrian village Sulzberg. The trail begins directly at the ski lift towards the well "Kalter Brunnen". First it's more increasing, afterwards it becomes less increasing. The winter hiking trail leads you parallel to the cross-country ski trail in some sections. However, please don't walk on the cross-country track. It will take you approx. 40 minutes to reach the "Hochsträß". 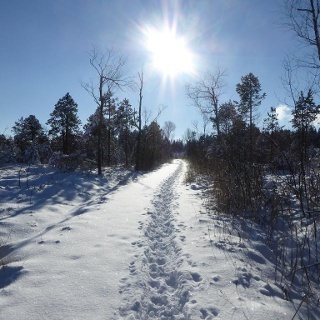 You can connect with the Sulzberg winter hiking trail. An incomparable mountain panorama is the reward for the exhausting ascent. schöne Wintertour ( vor allem bei Schnee ) nach Sulzberg. Teilweise anfangs im Wald, danach auf sonnigen Pfaden entlang der Loipe Richtung Sulzberg mit schöner Bergsicht.